The Rob Roy Way is a 79 mile walk from Drymen to Pitlochry, linking together many of the places associated with Rob Roy MacGregor, the popular hero and outlaw who lived in these parts from 1671 to 1734. You can read his life story here. The official website includes an optional diversion via Amulree which makes the total distance 94 miles. Unlike Scotland's "official" long distance paths, the Rob Roy Way has come about through the efforts of enthusiasts and cooperation between walking groups and landowners. This means, for the moment at least, that it is not waymarked, and as a result you need a clear set of directions for the walk. The Rob Roy Way website at www.robroyway.com sets out details of the route. 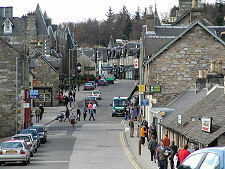 The RRW is usually walked from Drymen to Pitlochry. This means you will tend to have the wind, the weather and, hopefully, the sun behind you. It also leaves the more energetic parts of the walk until towards the end, when you will be fitter and more able to tackle them in comfort. Overall the walk is easier than the West Highland Way, being shorter and tending to cover better and less exposed ground. But despite this you'll need to know how to read a map, and to have good boots, warm clothes (whatever the time of year) and waterproofs. The side column gives links to useful resources. The route description below is broken into seven daily sections, each of which contains links to further information on Undiscovered Scotland. The Area Pages provide links to accommodation providers and other businesses. The Feature Pages each contain detailed background information and a collection of images about particular places or attractions on the Rob Roy Way or near it. And at the foot of the page is a selection of guide books. 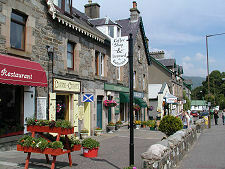 The Rob Roy Way starts in Drymen's main square and then heads generally north along minor roads and tracks to Aberfoyle. Shortly after leaving Drymen it crosses the line of the West Highland Way, but you are taking the less trodden route north east. This first section is generally easy walking taking in the Loch Ard Forest, with not much in the way of climb or descent. Aberfoyle lies at the heart of the Trossachs and you can find details of accommodation listed on the Stirling & Central Scotland area pages. The view west from the village is dominated by the cone-like summit of Ben Lomond. From Aberfoyle to Callander the route heads north-eastwards through the Menteith Hills and above Loch Venachar. This section is mostly along stony paths or forest tracks complete with a few boggy bits, and the final section into Callander is along a minor road. 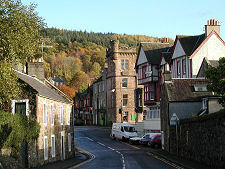 In the centre of Callander in a converted church overlooking a paved square is the Rob Roy & Trossachs Visitor Centre. As you are walking in Rob Roy's footsteps this is a good opportunity to find out more about him via the "Rob Roy Story". The Tourist Information Centre here is a particularly good one. Details of the plentiful accommodation available in Callander can be found listed on the Stirling & Central Scotland area pages. The third section is slightly shorter than the first two, and largely follows Cycle Route 7 along the route of the disused Callander and Oban Railway to Strathyre. The guidebook describes how to bypass Callander to combine Sections 2 and 3 into a single section of 16.5 miles. The walking on Section 3 is on good ground on the disused railway and, as you'd expect from a railway line, not much climbing or descending. Highlights of the day include following the west shore of Loch Lubnaig after passing under the prominent peak of Ben Ledi to your left. 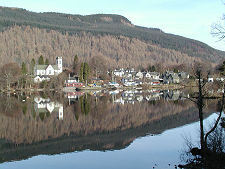 Accommodation in Strathyre can be found listed on the Stirling & Central Scotland area pages. Section 4 is along well surfaced routes using tracks, minor roads or cycle track. From Strathyre you head north on paths as far as the King's House Hotel, complete with its Rob Roy Bar. The main route of the Rob Roy Way carries on north from here, once more on Cycle Route 7. 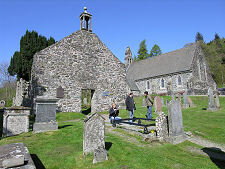 A side trip for the energetic takes you two miles west to Balquhidder to view Rob Roy's Grave before returning (another two miles) to pick up the route of the Way. The Way then passes close to Lochearnhead before climbing up Glen Ogle and heading towards Killin. Killin is entered over an old stone bridge (carefully as its single track is shared with the traffic) from which there are tremendous views of the Falls of Dochart. 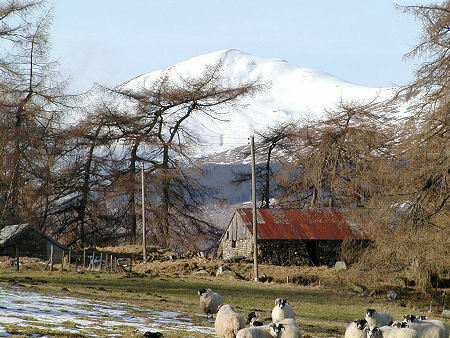 The village itself is overshadowed by the knobbly ridge of Meall nan Tarmachan. 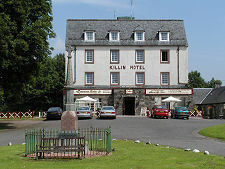 Accommodation in Killin can be found listed on the Stirling & Central Scotland area pages. From Killin you climb rough tracks to a height of 1,900ft or 575m on hills overlooking Loch Tay and the Ben Lawers ridge before descending to follow the South Loch Tay road to Ardtalnaig. Details of accommodation can be found via our Perthshire area pages, though this may be an occasion when you consider broadening your accommodation choices by hitch-hiking back to Killin or on to Kenmore or Aberfeldy and reversing the process at the beginning of the following day. 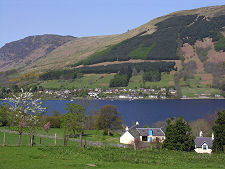 From Ardtalnaig you follow the South Loch Tay road to near Kenmore and its Crannog Centre before following a route on the south side of the Tay Valley. After an initial few miles on a minor road, this section of the Way follows farm and field tracks, finishing with an approach to Aberfeldy through the birch woods surrounding a rocky gorge called the Birks of Aberfeldy. Details of accommodation in Aberfeldy can be found via our Perthshire area pages. It's worth noting in passing that the Rob Roy Way web site sets out an optional excursion into the mountains south of Loch Tay that adds an extra 15 miles to the route and takes an extra day. This is a fine walk in its own right but seems to us to involve too much doubling-back to be part of a long distance path. If you have time and energy to spare we include an alternative suggestion for its use below. The final stretch follows paths and tracks climbing to 1,150ft or 350m en route to Pitlochry. On the way you enjoy two remarkable bridges. 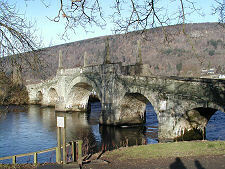 On the outskirts of Aberfeldy you cross General Wade's Bridge over the River Tay, built in 1733 in the aftermath of the 1715 Jacobite uprising; while your final entry to Pitlochry is across the swaying suspension bridge over the River Tummel built in 1913. And if you do have time and energy to spare having completed the Rob Roy Way? 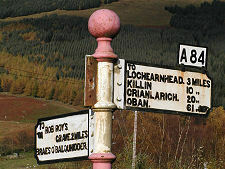 The old road from Blair Atholl, 7 miles north west of Pitlochry, to Kingussie did not follow the route of the modern A9. Instead it followed a mountain track called the Minigaig, which heads slightly west of north for some 30 miles before emerging at Ruthven Barracks near Kingussie. Bear in mind that the Minigaig is a wild and lonely route with no accommodation and should not to be tackled by the inexperienced, ill-prepared, or un-tented. You would also need to bridge the 7 mile gap from Pitlochry to Blair Atholl. There is a minor road, but an alternative to walking, hitch-hiking or catching a bus might be one of the half-dozen trains that connect the two each day, with a journey time of about 10 minutes. Maps: The Ordnance Survey 1:50,000 maps of the areas crossed by the Rob Roy Way are Landranger maps 57, 51 and 52.